The song “Wrecking Ball” was originally written to commemorate the destruction of Giants Stadium in 2009, and performed during Springsteen’s final shows at the historic venue. This live version was later released as a single, so it’s been familiar to Springsteen fans for some time now. To be honest, it’s never been a song I had that much enthusiasm for; I liked it, and it’s been part of my regular Springsteen rotation since its release, but I’ve never loved it as much as some of his classics. The studio version of “Wrecking Ball,” on the other hand – the one included on the new album of the same name – is one of the absolute best songs Bruce has ever written and recorded, and it’s shot right into my Top 20 Springsteen tracks of all time, maybe even Top 10. The question, of course, is why this version of the song resonated so strongly with me where the original live recording didn’t. The lyrics haven’t changed. The music hasn’t been substantially reworked. The answer comes down to two even simpler elements: 1) The performance and production are simply marvelous, one of the most impressive musical accomplishments of Bruce’s career, and 2) Heard in context on the album, “Wrecking Ball” takes on many new layers of meaning and inspirational power. Springsteen uses lots of sports metaphors and local imagery, and as performed by the E-Street Band, it’s meant to be a rousing stadium rocker. Despite the stadium’s impending demise, it’s actually a hopeful song, with Springsteen suggesting that even if the wrecking ball is brought through, everything the stadium stood for, including the dedicated community that loved it, will still remain. The stadium is infused with the spirits of former glory, and no amount of destruction can drive them out: “So raise up your glasses and let me hear your voices call/Because tonight all the dead are here, so bring on your wrecking ball.” As I said, it’s a song I liked, with a pleasing message, and a very fun E-Street Band performance. But it also sounded like a piece that was much more meaningful for those watching Springsteen play it in Giants Stadium; it was clearly such a special experience that whenever I listened to a live recording, I always felt distanced from whatever power the song contained. This new studio recording, however, hit me right in my heart, and hard, and in the several times I’ve listened to it so far, it’s never failed to make me teary (and on the first listen, I outright bawled). For the most part, it’s the new sense of context that gives power to the piece; Wrecking Ball is an expertly paced and sequenced album, and this track is the big emotional climax Springsteen has been building to over the last six songs. We’ve heard stories of economic hardship, of ruined hometowns, small-time robbers, wandering workers, and depression, and in this song, Springsteen ties it all together while vastly broadening the album’s thematic scope. In context, Springsteen is no longer singing about Giants Stadium; the arena is now a metaphor for the peaceful and treasured way of life the album’s characters used to know. On an immediate level, it’s a stand-in for the American Dream, and the wrecking ball is about to be brought through. If you’ve been paying any amount of attention thus far, you’re aware that, in Springsteen’s mind, the American Dream has already been demolished; that’s why the characters of the first six tracks are in such dire straits. In “Wrecking Ball,” Springsteen paints those characters a portrait of hope, saying that even though it may feel like the Dream we once enjoyed is gone forever, it still exists inside the hearts of every American willing to believe in it, no matter how hard certain forces seek to take it from us. But that’s just the surface. To my mind, Springsteen is singing about so much more than just the American Dream, or about people experiencing financial hardship. He’s chosen to stick with the stadium imagery for a reason: it’s a shorthand representation for much that we, as human beings, cherish in this world: community, strength, glory, memories, and above all else, good times. Going to the local arena and feeling such emotions is a universal experience, and that indicates that Springsteen’s message here is, indeed, universal. In its purest form, the stadium represents the human soul, and the wrecking ball is any circumstance or force that threatens to crush the spirit. Thus, the song’s message is that no matter how much damage the human heart endures, the soul will stand strong. To my mind, this is what Wrecking Ball the album is all about: the resilience of the human spirit in the midst of suffering. The economic material of the album’s first half exists chiefly as a springboard into this discussion; it’s a palpable, instantly relatable hardship that has brought many to the brink of destruction, but in Springsteen’s experience, he knows that even times like these aren’t enough to demolish the soul. That’s why he demands “Take your best shot, let me see what you’ve got, bring on your wrecking ball.” He’s seen the ball brought through before – and chronicled it on several older albums – and is positive that it won’t destroy what really matters. That verse takes on such incredible new levels of meaning heard in context on the album; every line references death in some way or another, but the singer shows no fear, for he believes in something more significant. What is this, though? Is it the afterlife? Is it memory? Springsteen will elaborate on this for the rest of the album, but the simple answer is that there is some ethereal component of the human condition that gives us strength in life and in death, in good times and in bad times, and it will carry us through even the most intense suffering. It’s why Giants Stadium isn’t really gone; it’s why the American Dream, despite overwhelming evidence to the contrary, is still a meaningful part of our country; it’s why humans can stand strong and resolute no matter what the odds. The soul endures, and no wrecking ball can change that. I’ll leave further discussion of these themes for later articles, because the album’s extended finale fleshes out everything Springsteen sketches here. For now, I’ll just say that “Wrecking Ball” absolutely floored me, and though the deeper meaning I’ve spent 1500 words analyzing plays a big part in that, the music itself is just as important. First and foremost, this is one of Springsteen’s all-time greatest vocal performances. He has always been a talented and passionate singer, but the precision, control, and conviction he displays here is flabbergasting. He grips you from the first lyric and holds on to the very end, his tone beautiful and clear, believing wholeheartedly in every last word he sings. The production, meanwhile, is flawless, displaying a similar level of control; it begins with nothing more than guitar and vocals, but gradually builds to include strings, drums (by mighty Max himself), claps, and more. The song builds to maximize emotional impact, and does so with such precision that there are certain moments that make me gasp, cry, or cheer every single time I hear them. The chorus is unique in that it’s instrumental, and when we reach it, we hear none other than Clarence Clemons, the Big Man, serenading us with his Saxophone from beyond the grave (sourced, I believe, from the live version). This single bit of instrumentation does just as much as the lyrics to tell us about life after death; the ghosts of the E-Street Band itself are here on the track. Just like the Stadium, and the Dream, and the Soul, Clarence can’t be destroyed. It’s such a gorgeous touch. I’m probably reaching a point of diminishing returns in this discussion, but that’s the curse of writing reviews: when you love something enough, it’s almost impossible to compose effective criticism. Bruce Springsteen’s music means more to me than I can describe, and this recording of “Wrecking Ball” is one of the best things he’s ever done. The song is a crucial turning point for the album; it’s such an effective emotional crescendo that it easily could have been the last track, but Springsteen has bigger, even more meaningful plans in store for the finale, and trust me when I say they must be heard to be believed. and since that moment I couldn't stop playing it, once, and once more, and once more again. I tried to explain myself why the song hit me so hard and I couldn't. I am not an English native speaker so part of the meaning of the lyrics eluded me; so I looked for help on-line and found your beautiful article and...I got it. I totally agree with you that this song is one of the all-time Bruce's greatest vocal performances. We wait 25 years for the Boss returning to Argentina, I really hope we would not have to wait so much to enjoy his visit again. Last Saturday performance has been my best concert ever. Thank you for your help! Really good writing, Jonathan. This song means so much to me when my family has a financial hardship. 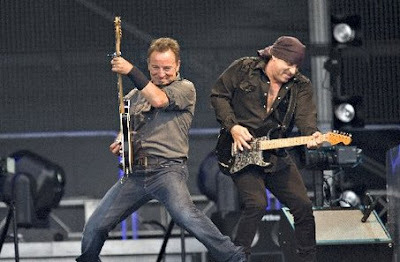 I hope i can see The Boss live sometimes. Really good writing Jonathan. This song means a lot to me when my family is having a financial hardships. I liked Wrecking Ball album just as Born To Run and the River. Cheers for the good times!